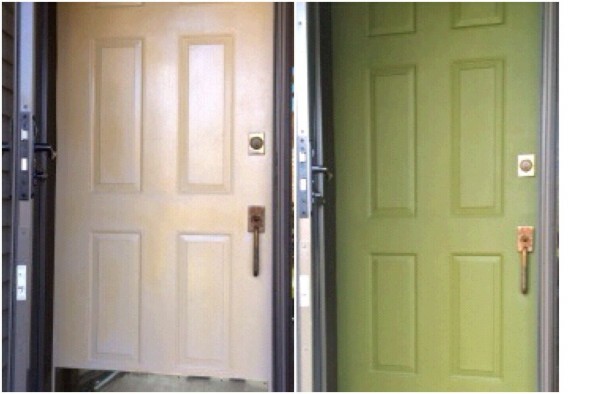 The refresh began with painting the yellowing cream colored door a green color. I was very please with the color choice. However, the hardware on the door was sad. I proposed to my husband to switch it out with a new lock and handle. Well, going along with his thoughts… If it isn’t broken, why fix it? I left it be. With winter approaching, the front door was not used as much and the and soon forgotten about. That only lasted until spring came and we were able to leave the door open once again.”Oh yah, there it was, that icky looking hardware” I immediately added it to my “to do list” and this past week I crossed it off as complete. I sprayed the hardware giving it two coats of an oil rubbed bronze color with drying time in between. Quick tip: remove the tape immediately. It makes the removal much easier. I added a new kick plate in the same color to the bottom and that was it. The updated painted front door was complete. It was an easy transformation that has definitely improved the curb appeal of the house I love taking something tired and freshening it up. Can you think of some additional and easy ideas to update the exterior without breaking the bank? It’s so much fun to tackle a project or two this time of year. I love the paint job you did! It makes it look so much more inviting. 🙂 Thanks for sharing and for partying with us at Talented Tuesday. Thanks for staing a look. Hi, Mary ~ Your front door looks amazing! I love how the green and bronze compliment each other! 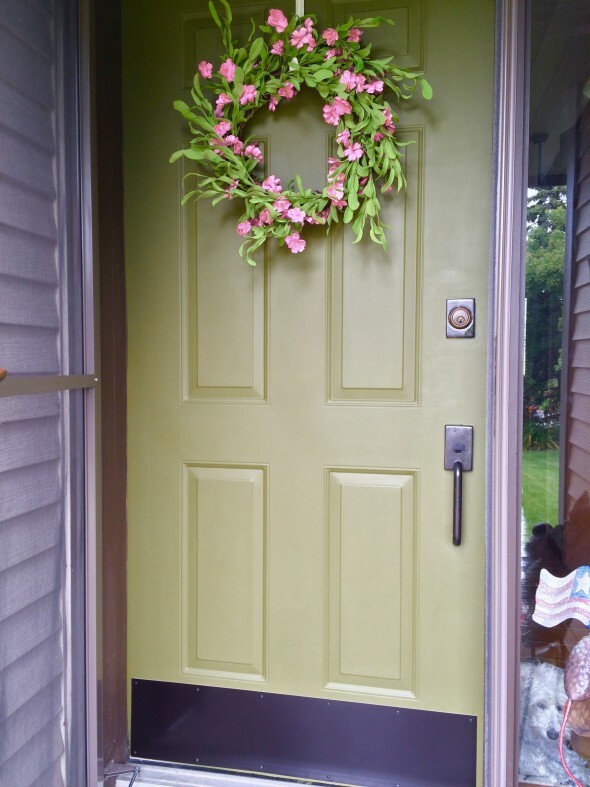 I never thought of painting door hardware, but now that I’ve seen you do it, I love the idea! Thanks for sharing! A nice refresh job, that wreath just sets it off nicely. Love the update. The new color is fantastic! I love the color! It’s so pretty and I’ve not seen that color on a door. The fact that it’s unique makes me like it even more. I’m in love with the hardware, too. I LOVE it!!! 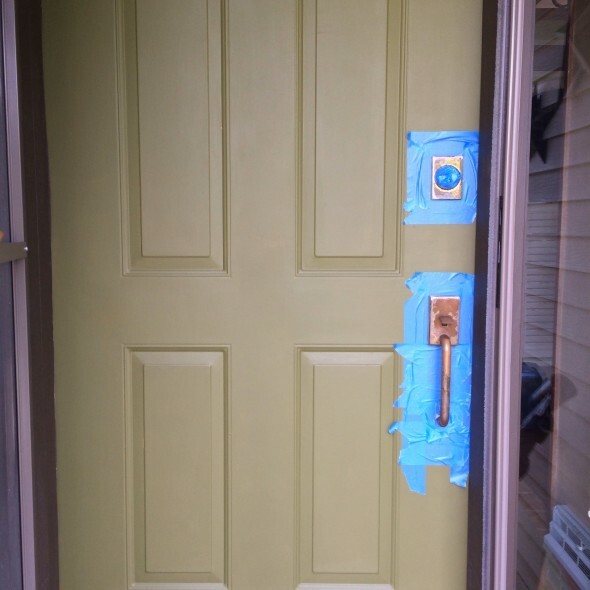 We just had our whole house painted, actually, but they painted the door, too. I think if the door had been left the old color it would have messed up the entire house LOL It makes such a statement! Yours is lovely! Kristen from The Road to Domestication recently posted…Tomato Ketchup: Health Benefits, and Make Your Own! Ahhh…..outdoor painting projects. We”re painting our outdoor trim. We have a pyramidal post just to the left of the front door. .I ‘m going to repaint it using the door color. Right now it’s the color of the house trim. That small change will spruce up the house! Thanks for sharing your project! Thanks for the comment. Changing up just a few things really makes a difference.